pEdhaimai thIrndhu ennai adimai koNda perumAnE !!! indha udambudan – inside this derisive body? ennum ivaiyellAm – (all these aforementioned things) you know for sure. ivai onRaRiyEn – does not know an iota of these. pEdhaimai thIrndhu – So, please remove my ignorance!!! ennai – me, who lives without any connection to this mortal coil (given to me in this birth)..
ErArum – which is a place that is exquisitely ornate and complete in beauty. maRandhu irukkiRadhen? – What are you contemplating and why is the delay? virayAmAl – and why are you not expediting it? 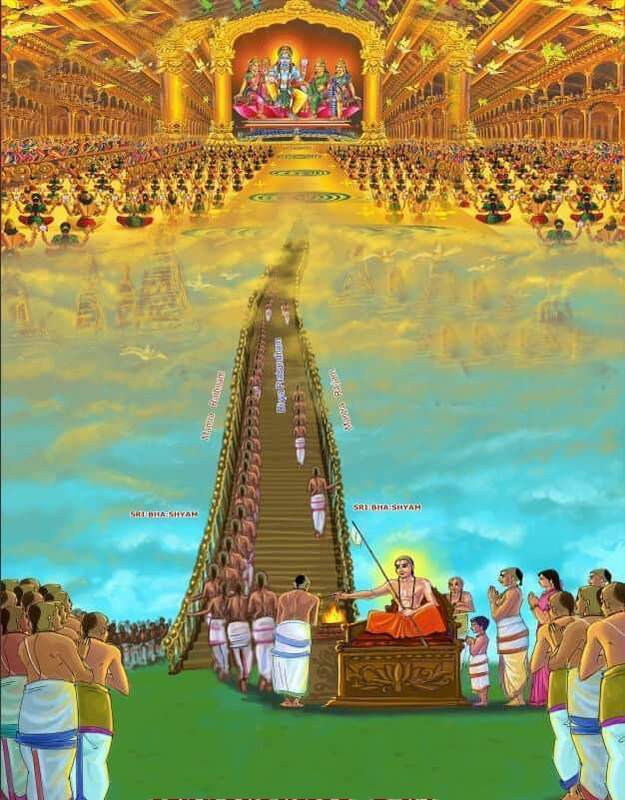 In this pAsuram, maNavALa mAmunigaL questions emperumAnAr as to what is the reason for his delay in liberating his soul and making him ascend to paramapadham. There is no shortage of compassion on emperumAnAr’s part and mAmunigaL is ready to leave his body at any time. Yet it does not happen and that makes mAmunigaL curious. The curiosity is reflected in the form of a question in this pAsuram. maNavALa mAmunigaL says “emperumAnArE! my svAmi! I was without the knowledge of your association earlier. You removed this void and made me realize my true self. You made me realize that I am a servant as mentioned in the phrase “vinaiyEn unakkadimaiyaRakkoNdAy (thiruvAimozhi 4.9.6)”. As a part of realizing my servitude towards you, you made me live by it and realize the significance of it. You are my svAmi indeed!!! I have a question for you. How much more do you plan to keep my soul in this derisive body? How long should I stay inside this body without any kind of true connection to it? You do know when this body will fall, you do know where it will fall and how it will. You know everything. I am completely oblivious of any of these. I do not know an iota of these”. mAmunigal continues, “my svAmi! I (my soul) is inside this body without any kind of liking or attachment. If you wish to liberate the soul from the body and make the soul ascend to the beautiful paramapadham, why are you delaying in doing so? Why are you not speeding the process as they say in the phrase “viNNulagam tharuvAnAy viraiginRAn (thiruvAimozhi 10.6.3)”? Please let me know the reason for the delay. There is no question about your infinite mercy. There is no reason on my part that prevents liberation. Then what is it that prevents you?”. There is yet another recitation way when it comes to the penultimate line, “maRandhu irukkiRadhen? pEsAy”. They also say “amarndhirukkiradhen pEsAy”. This entry was posted in Arththi prabandham, Other and tagged arththi prabandham, emperumanar, mamunigal, manavala mamunigal, ramanuja on January 10, 2017 by santhanam rajagopalan.